Since the invention of the motor vehicle over a century ago, it is estimated that about 30 million people have been killed in road crashes worldwide. 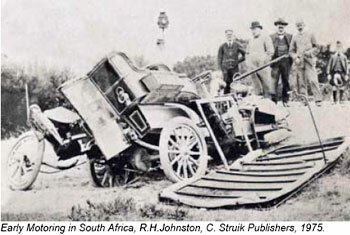 The first road crash recorded in South Africa happened in the evening on 1 October 1903 in Maitland, Cape Town. The driver of the vehicle entered a level crossing through an open gate only to find the opposite gate closed. Before he or his passenger could open the gate or reverse, they were struck by the Johannesburg express train travelling at full speed. The passenger was thrown clear and the driver suffered only minor injuries. The motorcar was badly damaged, (see photograph below). The enquiry into the crash revealed a remarkably casual attitude by drivers of motorcars towards level crossings. Since this crash in 1903 to the end of 2003, one century later, a total of about 393,977 persons (1,31% of the world total) were killed in crashes on South African roads, mainly as a result of the “remarkably casual attitude by drivers of Motorcars” towards law compliance. There is a great variety of contributory factors that lead to road traffic crashes, most important of which are: the level of driver training; the general attitude of drivers; driver behaviour and the level of driver self-discipline, self-regulation and law compliance. All of these relate to human factors in the road traffic environment. Ever since the invention of the motor vehicle, speed as a factor in road crashes was a bone of contention. There are generally two schools of thought about the relationship between road traffic crashes and speed – the first group saying that there is a relationship (“speed kills”) and those that say there is no relationship. The second group also states that all drivers should be assumed to be responsible and therefore be allowed to select and drive at any speed that they are comfortable with. The second group also almost always refers to some Western European countries as “typical” examples of countries with high speeds and low accident rates. What this group tend (or prefer) to forget is the fact that these countries most probably also have an excellently maintained road network; vehicles that are continuously maintained to a high standard; drivers that are generally well trained and skilled, with much better attitudes and more courteous driver behaviour; and where drunk drivers and pedestrians pose no problem due to a high level of self-discipline. The fact is that in Europe, according to the Commission of the European Communities Road Safety Action Programme, published in June 2003, excessive and improper speed is the cause of about a third (33%) of fatal and serious accidents and a major factor in determining the severity of injuries. The European Union report further elaborates on the role of alcohol, drugs and fatigue in the road traffic environment and states that drinking and driving were found to be responsible for no less than 10,000 deaths per year in Europe. In a study undertaken in the United States of America (USA) in the late 1990s, it was found that speed contributes to 18,7% of road crashes. The contribution of alcohol was in the order of 18,2%. In Australian research in the 1990’s it was found that the risk of involvement in a crash in a 60 km/h zone doubles for every 5 km/h in excess of the speed limit. 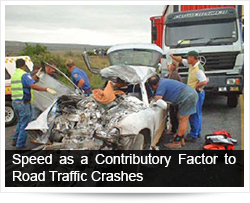 A report was prepared in February 2005 on contributory factors to road crashes. The purpose of this report is to provide some information on contributory factors to fatal road crashes in South Africa, with particular emphasis on the role of speed in the form of speed too high for circumstances and excessive speed. During intensive research undertaken by the CSIR in South Africa from the mid-1970s to the mid-1980s, it was found that the lowering of speed limits (resulting in lower operating speeds on the rural road network) had an overwhelming effect on the occurrence of road accidents. A reduction in the speed limit from 120 km/h to 80 km/h resulted in a decrease in the casualty crash rate (number of casualty crashes per million vehicle kilometres travel) from about 0,59 to about 0,44. 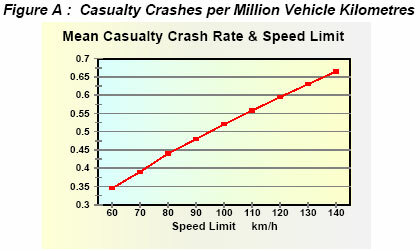 It was found that the relationship between the crash rate and the speed limit was almost linear, as shown in Figure A below. It was further found that a decrease of 1 km/h in the mean or average vehicle speed in rural areas resulted in a decrease of 9 fatal accidents and 120 total accidents per month. During this period an estimated 12,500 lives were saved due to about 140,000 fewer accidents. It should be noted that during this period there were also very high levels of self-discipline and self-regulation amongst South African road users, accompanied by a high level of law enforcement. According to a similar study by the Transport Research Laboratory (TRL) in the United Kingdom in the late 1990s, a reduction in an average speed of 3 km/h would save 5,000 to 6,000 lives each year in Europe and would avoid 120,000 to 140,000 accidents. In a study undertaken by the Department of Transport in the late 1990s to review the speed limits and develop standards for the setting of speed limits, it was found that the speed limits in South Africa rated amongst the highest in the world. The study concluded that, although it may be relatively high, the current limits should be retained. It is, however, not the purpose of this report to review the relevancy of the currently applicable speed limits but to indicate to which extent the set limits are ignored. It is generally accepted in basically all countries, including South Africa, that not more than about 15% of the traffic should exceed the limit and that this 15% should be subject to effective enforcement and prosecution. The current local situation is actually much worse. It was found in an extensive speed analysis of about 25,000,000 vehicles of all types in 2004 that the average speed increased by about 9% from 2003 to 2004. The information analysed further showed that, particularly over weekends, in the order of 30,4% of drivers exceed the 120 km/h limit; about 14,1% exceed 130 km/h and 5,9% drive faster than 140 km/h. 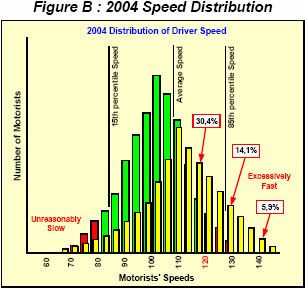 These figures in yellow are superimposed on a more desirable speed distribution curve in green in Figure B below. The figures above in yellow indicate a much wider spread of speeds amongst vehicles in the traffic situation, with the higher group affecting an increase in the average speed. It further increases the potential conflict between drivers that are driving excessively fast and drivers in the lower 15% group that drive unreasonably slow, thus increasing the risk of being involved in a crash, as well as the severity of a crash, should it happen. Although excessive speeds and particularly increased speed differentials between vehicles was found to be a major contributory factor to road crashes, not only in South Africa but also in many overseas countries, the local traffic situation creates a much higher safety risk than some other countries. In this regard the factors that should be brought into the full equation include, amongst others : the level of training and skills of drivers; the number of fraudulently obtained driving licences; the high levels of drunk drivers and pedestrians on the road network; the high level of general lawlessness, such as unsafe and overtaking across barrier lines and skipping of red robots; the high level of reckless, negligent, inconsiderate, ignorant and aggressive drivers; changing lanes without indicating the intention to do so; following too close and swerving in front of other traffic; racing from robot to robot; the high number of un-roadworthy vehicles with faulty brakes, lights, steering and damaged or worn tyres; with added roads that are not maintained to acceptable standards and a general lack of pedestrian facilities, etc. All put together on the road, including the unacceptable low level of law enforcement, is a definite recipe for disaster. Driving at unreasonable slow and excessively high speeds encourages further transgression of the law, such as ignoring red robots and unsafe overtaking; as well as aggravating the effect of all the other contributory factors to road crashes. For example, driving at an excessive, un-appropriate speed at night and encountering a slow-moving vehicle with faulty lights; or a stray animal or a drunk pedestrian greatly reduces the response time and decision-making distance for the driver of the fast vehicle. In order to effect a lasting change in the current road safety situation, all of these issues should be vigorously addressed and improved. An improvement in only one of these issues could, however, also affect an improvement in the overall situation – such as ensuring a meaningful reduction in the unacceptably high percentage of drivers exceeding the speed limit and those driving at excessive speeds. According to SAPS reports to the National Fatal Accident Information Centre (NFAIC) at the Department of Transport, the number of fatal crashes that occurred due to excessive speeds or speed too high for circumstances, increased by 1,093 (46,10%) from 2,370 in 2003 to 3,463 in 2004. In 2003 fatal crashes in which speed played a role where 23,24% of a total of 10,246 fatal crashes. In 2004 fatal crashes in which speed played a role increased to 32,94% of a total of 10,523 fatal crashes. The estimated number of fatalities resulting from speed-related fatal crashes increased by 1,326 (46,41%) from 2,857 in 2003 to 4,183 in 2004. From 2003 to 2004 there was a national average increase of 0,21% in the severity of fatal crashes (the average number of persons killed per crash). The severity is, amongst others, dependent on the speed at which crashes happen, the higher the speed the bigger the impact, resulting in an increase in the severity rate. One Province showed an increase of 12,28% in the Provincial severity rate from 2003 to 2004. This province also showed an increase of 63,17% in speed-related crashes from 2003 to 2004. During an in-depth investigation into speed profiles on the national road network during 2004, it was found that the Province mentioned above also had the highest percentage of excessive speeds in the country. In comparison with the speed figures reflected in Figure B above, the percentage of drivers exceeding the speed limit in this Province was found to be as follows: 48,25%>120 km/h; 28,27%>130 km/h and 13,60%>140 km/h. With regard to fatality rates in the particular Province under discussion, it was found that there was an overall increase in rates as follows: The number of fatalities per 10,000 registered vehicles increased by 9,79% from 31,18 in 2003 to a rate of 34,24 in 2004; the fatality rate in terms of the number of fatalities per 100 million vehicle kilometres travelled increased by 9,91% from 13,22 in 2003 to 14,53 in 2004; and the number of fatalities per 100,000 human population increased by 13,72% from 35,33 in 2003 to 40,00 in 2004. These increases in rates strongly correlate with the high percentage of drivers exceeding the speed limit in 2004. The total cost of fatal crashes is estimated at R8,566.11 million for 2003 and R8,834.83 million for 2004. On a national basis, the estimated cost of speed-related fatal crashes increased by R925.79 million from R1,981.67 million in 2003, (23,13% of the total estimated fatal crash cost) to R2,907.46 million in 2004, (32,91% of the total estimated fatal crash cost). The above information is summarized in the table below.